A new European competition for champions of 27 nations located in Eastern Europe. Created by FM-Players.net for Football Manager 2014. A new European competition is created. It is a UEFA League East Gazprom. This competition play champions 27 states that have at least a small part in Eastern Europe. Enough strong game, good cash prizes and fun are guaranteed. Here, the competition begins six teams. The game is played on a knockout system, and they won games matches go in the group stage. 21 teams qualify directly, while three teams from dolaaze qualifications. Formed 8 groups of 3 teams. The game is played by Salt-point system. Group winners go into the next phase of the competition. They play games matches. The winners go on F4. Sam finals of this competition is played at the stadium Zenit [Gazprom-Arena]. At the end of this competition can earn up to 30M €. Create the folder "editor data" if it doesn't exist. Start a new career game (won't work with classic mode). A little pop-up window will come up that says there is 1 enabled editor file. Click OK. Created by FM-Players ReSearch Team. 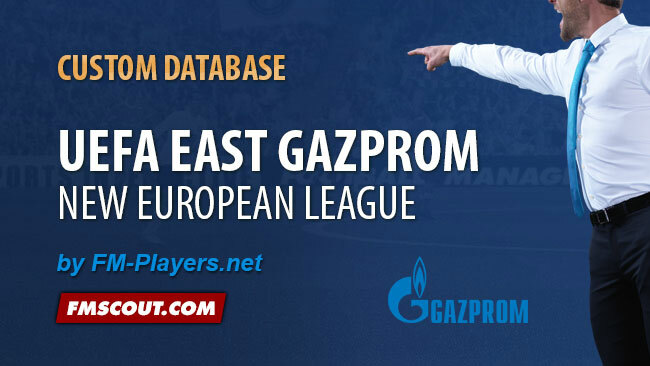 UEFA EAST GAZPROM LEAGUE FOR FM 2015? Hi! Which countries participate at this League? Thank you. Doesnt work for me. i have downloaded it and extracted the file but it doesnt work?